FAITH LAPIDUS: Welcome to THIS IS AMERICA in VOA Special English. I’m Faith Lapidus. BOB DOUGHTY: And I'm Bob Doughty. November eleventh is Veterans Day. A veteran is anyone who has served in the armed forces. Veterans Day honors the living. A separate holiday, Memorial Day in May, is for those who died in military service. This week on our program, we tell you about a group of women veterans who as pilots played a special part in American military history. FAITH LAPIDUS: Earlier this year, the first female pilots ever to fly American military aircraft were finally recognized for their service. They were called Women Airforce Service Pilots, or WASP for short. In March, surviving members of the group received Congress' highest civilian honor, the Congressional Gold Medal. 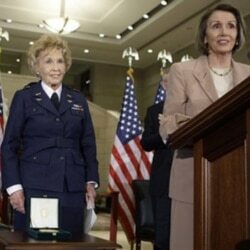 WASP veteran Deanie Parrish spoke at a ceremony held in the United States Capitol building. DEANIE PARRISH: "Over sixty-five years ago we each served our country without any expectation of recognition or glory. And we did it without compromising the values that we were taught as we grew up -- honor, integrity, patriotism, service, faith and commitment. "We did it because our country needed us. I believe I speak for every WASP when I say that it was both a privilege and an honor to serve our country during some of the darkest days of World War Two." BOB DOUGHTY: Many people did not believe women should be permitted to join the military. Even fewer thought women should serve as pilots. But in the early days of World War Two there was a severe shortage of male pilots. Jacqueline Cochran was a well-known female pilot in the United States at that time. She believed that training women to serve as support pilots at home could free up men to fly combat operations overseas. General Hap Arnold was chief of what was then called the Army Air Forces. Jackie Cochran persuaded him that women were just as able to fly planes as men. Women Airforce Service Pilots served their country by flying fighters, bombers and transport aircraft. They trained other pilots, flew test flights and pulled targets for shooting practice. They transported planes as well as troops and supplies, including parts of the atomic bomb. In all, they flew more than ninety-six million kilometers. FAITH LAPIDUS: More than twenty-five thousand women applied for the program. About one thousand eight hundred of them were accepted. And of those, about sixty percent completed the training. Women were required to take their own flying lessons before they could be admitted to the program. The first group of women began their military flight training in November of nineteen forty-two. The following year, twenty-five women were trained to fly an airplane known as the "Widowmaker." Some male pilots had refused to fly it because so many of the planes crashed during training. Several pilots were killed. The military believed the planes were safe if they were flown correctly. The women were asked to prove it. Deanie Parrish's daughter Nancy says they knew the dangers, but volunteered anyway in what she called a very important experiment. NANCY PARRISH: "Airplanes don't know the difference between men and women. They only know that you're a good pilot or you're not a good pilot. And these women were all very good pilots." BOB DOUGHTY: Yet the Women Airforce Service Pilots were never officially recognized as members of the military. The WASP program was canceled a few weeks after the last class graduated in nineteen forty-four. For one thing, the war was nearing an end. The women had paid their own way to get to the training base in Sweetwater, Texas. Now dismissed, they had to pay their own way to get home. Thirty-eight women lost their lives in the WASP program. There were no military honors for these women. Their own families had to pay for their burials. One of the pilots who died was named Mary Howson. Nancy Parrish retells the story of what Mary Howson's mother told WASP trainees in Texas shortly after her daughter's death. "She said 'I'm going to read you the telegram that I got from the United States government when Mary was killed.' And she pulled it out and she unfolded it and she read it to this group of trainees. "And this is what it said, 'Your daughter was killed this morning. Where do you want us to ship the body?'" FAITH LAPIDUS: The Women Airforce Service Pilots fought for years to get the recognition they had earned. World War Two ended in nineteen forty-five. But not until nineteen seventy-seven were the women fully recognized as military veterans. And only now are they being honored for their service. Fewer than three hundred are still alive. More than two hundred of them attended the Congressional Gold Medal ceremony. Some wore their old uniforms. Deanie Parrish accepted the medal for the group. She said the award itself was not as important as what it represents. DEANIE PARRISH: "All we ever asked for is that our overlooked history would someday no longer be a missing chapter in the history World War Two, in the history of the Air Force, in the history of aviation, and most especially the history of America." BOB DOUGHTY: Today, most military jobs are open to women, although there are still restrictions on combat duty. More than two and a half million women have served in the military since the American Revolution in the seventeen hundreds. There are several stories of women who pretended to be men so they could join the military. For example, a woman named Deborah Sampson changed her name to Robert Shurtlief so she could fight in the Revolution. From that time through the end of World War Two, more than one hundred thousand women served as military nurses. Hundreds of thousands of others served as cooks, coders, telegraphers, signalers and spies. But the military did not officially accept women as pilots until nineteen seventy-six. That was more than thirty years after the service pilots of World War Two. And it was still several years before their story became widely known. Deanie Parrish and her daughter Nancy launched the organization Wings Across America. The purpose is to educate Americans about the WASP program. They have interviewed more than one hundred of the women who served. And they hope to interview the nearly two hundred other surviving members while there is still time. Parts of the interviews can be seen in a video at wingsacrossamerica.org. FAITH LAPIDUS: In two thousand, the Library of Congress launched its own Veterans History Project. Congress wanted the nation to hear the stories of its older veterans and to keep those memories alive. More than one thousand veterans die each day. The American Folklife Center at the Library of Congress collects recorded stories and written histories from veterans. It also collects memorable objects from their service days. The project includes veterans who served in the first and second world wars, Korea and Vietnam. It also includes men and women who served in the Persian Gulf War and the continuing wars in Afghanistan and Iraq. BOB DOUGHTY: Veterans Day started as Armistice Day on November eleventh, nineteen nineteen. That was the first anniversary of the armistice or cease-fire agreement that ended hostilities in the first world war. In nineteen fifty-four President Dwight Eisenhower signed legislation to change the name to Veterans Day. Today there are about twenty-two million veterans in the United States, including one and a half million women. Over the years Congress has passed legislation like the "GI Bill of Rights." The GI Bill helped many World War Two veterans pay for college and buy a home. But America has long had a mixed and sometimes sorry record of how it treats its veterans. These include service members who came home wounded or disabled from Iraq and Afghanistan. The United States is now in its tenth year of war -- longer than any other time in American history. FAITH LAPIDUS: On Veterans Day, communities take time for parades and speeches in honor of those who served their country. At the same time, many Americans will think of family members and friends still serving in harm's way. BOB DOUGHTY: Our program was written and produced by June Simms. I'm Bob Doughty. FAITH LAPIDUS: And I'm Faith Lapidus. You can read, download and comment on our programs at voaspecialenglish.com. You can also join us on Facebook and Twitter at VOA Learning English. And join us again next week for THIS IS AMERICA in VOA Special English.